Dave’s four hardworking Rugers (from left): American Rimfire compact models in .22LR, .17 HMR and .22 WMR. At far right is a lone centerfire — an American Ranch rifle in .223. Rifles serve many purposes — hunting, formal and informal target shooting, collecting and home defense. Although society has become more urban and less rural, there are still farms and ranches where rifles are simply everyday working tools. Our farm is fairly remote. The nearest neighbors (two of them) are a mile away; the nearest traffic light is 40 miles away. I don’t want to give the impression life on the farm is a constant battle with wildlife. “Live and let live” is my philosophy. The only species for which a shoot-on-sight policy exists is feral pigs, which are becoming a serious problem. Otherwise, if they leave us alone we leave them alone. Exceptions are handled on a case-by-case basis. We’ve had raccoons set up residence in grain bins and storage sheds, squirrels raiding the purple martin houses, coyotes killing our cats, and skunks — not doing any harm, really — but I don’t want them taking up residence under a shed 20 yards from the house. Most annoying are the ground squirrels and gophers, whose greatest delight is raiding the garden. We don’t go through the trouble of digging, raking, planting, weeding and watering just so they can feast on our carrots and peas. My wife Simone is the kindest person I know, but her reaction to gophers puts me in mind of Kipling’s poem The Female of the Species. The only time I want my firearms loaded is when they are under my direct control — in my hands, in a holster, or slung over my shoulder. If I’m working outdoors and a gopher pops up in the garden, I want to be able to pick up the rifle, load it with a magazine from a pocket, fire a shot, then unload, hang up the rifle and go back to work. Semi-auto .22s are great for plinking and hunting, but the convenience aspect makes them less attractive as a farm rifle. After firing a shot I have to remove the magazine, clear the chamber, find the ejected round on the ground if I dropped it (which happens a lot), then reload it into the magazine. Rifles with tubular magazines are likewise inconvenient. Unless you want to use them as a single-shot, it takes time to load cartridges into the magazine tube, and to unload unfired cartridges. It can work if you’re comfortable having the chamber empty and magazine tube loaded all the time, I’d just rather not. What I like is a rifle with a manually operated action and a detachable box or rotary magazine. For a rifle carried on an ATV or in a pickup, I find a compact overall length a desirable feature. The rifle should be rugged and tough since it will be used in all sorts of weather and is subject to dings and scratches. At the same time I refuse to sacrifice performance. I want accuracy, a decent trigger, smooth and reliable operation, good balance and handling, and long-term durability. I want a quality rifle, not some piece of disposable junk. Dave’s go-to farm rifle? A Ruger American Rimfire in .22 WMR with a Redfield 3-9x40 scope. When he’s out and about, he keeps it unloaded with the bolt closed to keep dust out of the chamber, but has a loaded magazine in his pocket. The Ruger American Rimfire (compact version) checks all the boxes for me. It’s a tough, reliable and accurate bolt action using the superb Ruger rotary magazine. With its 18" barrel and 12.75" length of pull, overall length is under a yard. Weight is 5.3 lbs. I like this rifle so much I bought three — one each in .17 HMR, .22 LR and .22 WMR. I suppose some are now thinking, Dave, you moron, you should have gotten the Standard model in stainless steel with an 18" barrel, adult (13.75") length of pull and supplied Picatinny style scope rail. Correct on all counts (I hope not the moron part) but I bought these long before the stainless models went into production. I’m not going to the trouble and expense of trading in my rifles, but agree stainless is the better option. If and when bluing wear becomes a problem, I’ll likely have a Cerakote finish applied. Rural rimfire menu (from left): .22LR 40 gr., .17 HMR with 17-gr. Hornady and 20-gr. Winchester loads, .22 WMR with 30-gr. Hornady, 40-gr. CCI Maxi-Mag and 50-gr. Federal. The .22 Winchester Magnum Rimfire (WMR) appeared in 1959. A pal had one. I was impressed with the performance but aghast at the price of a box of ammunition — I could buy five boxes of .22 LR for the same amount. 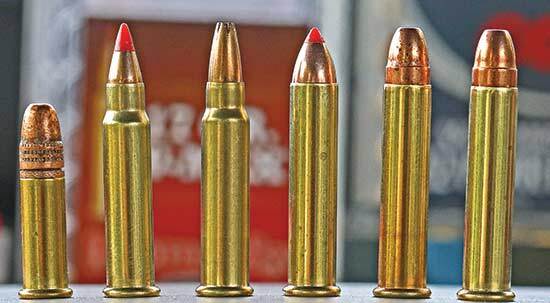 After buying a Winchester 9422M in the mid-’70s I realized it’s better to consider the .22 WMR as an inexpensive centerfire rather than as an expensive rimfire. On paper it doesn’t seem particularly exciting, producing some 50 percent more velocity than the .22 LR. In practice I find it to be far more effective. Gophers and rats might crawl away with body hits from a .22 LR; with the .22 WMR they usually take flight and hit the ground dead. I’ve shot raccoons, badgers and coyotes with the WMRF at ranges from 50 to 100 yards, almost always with one-shot kills. I’ve owned and shot several .17 HMR rifles and shot hundreds of ground squirrels and prairie dogs with the cartridge. I think of it as a .22 LR with twice the effective range. But for bigger varmints I much prefer the .22 WMR with 40- or 50-gr. bullets.